I just can't let anything go to waste. My husband can testify to the mounds of "junk" that gets stacked everywhere. Just today I was telling him of a recent epiphany: I have an aversion to empty space and feel compelled to put something in said empty space. After ten years of marriage, this wasn't news to him. Seems he knows me better than I know myself! This is a few months worth of beer bottle caps originally collected for a tray makeover, an idea that I never totally committed too. Here the caps were sorted either according to color or interesting picture. My sister collects beer bottle stickers and adores a good home brew from the state of her birth. I thought these magnet caps would make a cute house-warming gift for her newish place. Magnets seem like a pretty straightforward craft project, one would think. 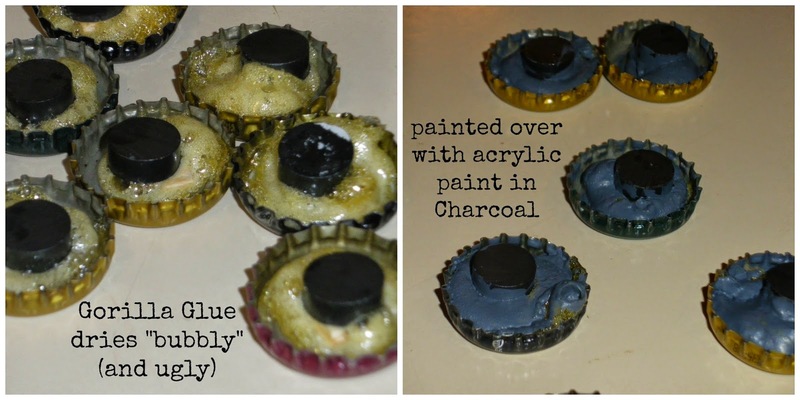 How can you screw up magnets + glue + bottle cap? Oh, it can be done. Especially if the wrong glue is used. I had made letter magnets to help the kids learn how to spell our ridiculously long last name. Great idea but the wrong glue quickly had the caps falling to the floor and under the fridge. Its a "fun" way to find out that you can rearrange the letters in your name to spell lame. Usually Tacky Glue is a favorite of mine but something about the plastic in the bottle cap and the plastic coated magnet just didn't gel with the Glue. Using Gorilla Glue presented its own problem: ugly bubbly. When all was said and done, the magnets came out cute! As a plus, they work! No falling to the floor and hanging out under the fridge. This project is left over from my teaching days. In class we used lima beans with the lower case letters written on them. After a few uses, though, the lima beans would start to break apart. Grrrrrrr! The board is actually laminated construction paper. The upper case letters were a set of stamps from Oriental Trading Company (some ten years ago). 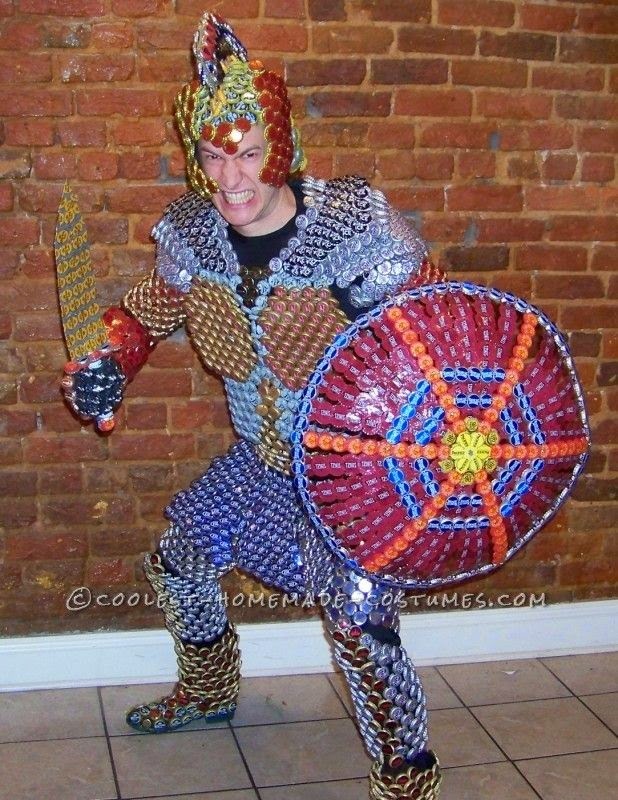 All these bottle caps had a gold base and the tops only were coated with chalk paint from Hobby Lobby. I used actual chalk to write the lower case letters, then sprayed with a clear coat of spray paint. To sharpen the letters, I retraced in chalk and resprayed. There is still a decent amount of bottle caps to use and no shortage of future caps to be added! Hmmmm, maybe save enough to make my own Halloween costume???? I love the idea of using these with chalk paint rather than throwing them away! Upcycling is one of my favorite things to do. 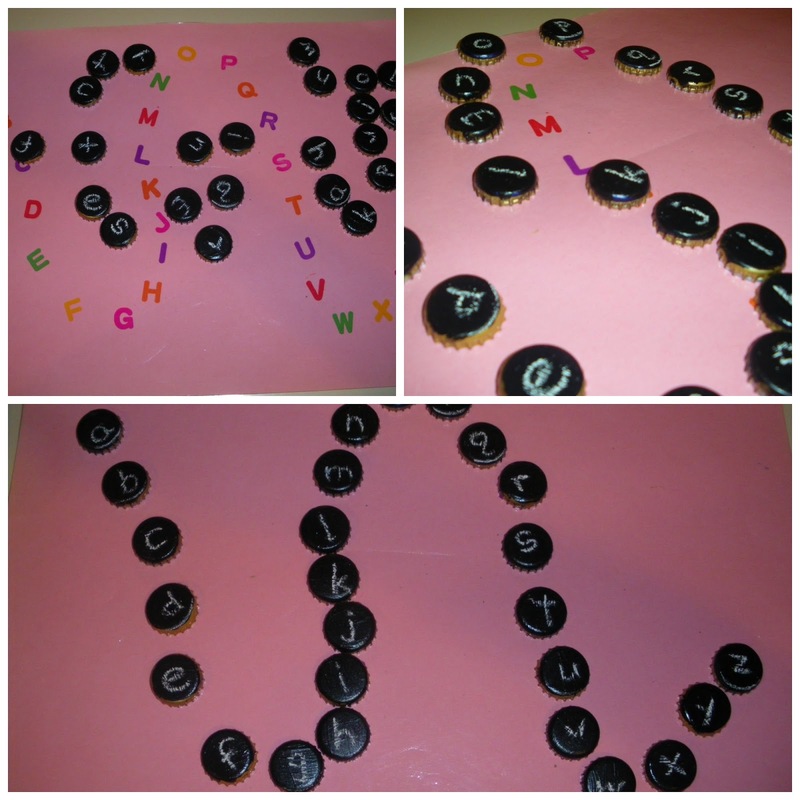 I like the way you made these into an alphabet game using chalk paint. I can imagine those lima beans didn't hold up for long! Thanks for sharing at Merry Monday! The new party starts tonight at 9pm EST, hope to see you there.